This the history of of Hess & Eisenhardt, a firm better known as Sayers & Scovill to today's professional car enthusiasts. The history of the professional cars built by Hess & Eisenhardt is located elsewhere - on the Sayers & Scovill page. This page covers the limousines and armored vehicles produced by the firm from 1942-1992. Willard C. Hess's grandfather, Emil E. Hess, and Charles A. Eisenhardt Sr. began working for Sayers and Scovill in 1891. Willard C. Hess (1906-2000) began working for Sayers and Scovill in 1930 after graduating from General Motors Institute in Flint, Michigan. Along with Charles A. Eisenhardt Jr.(1908-1988), another S & S employee, the pair bought an interest in S&S during 1938. The firm's principle owners, all Sayers & Scovill heirs, decided to close its doors at the start of WWII. 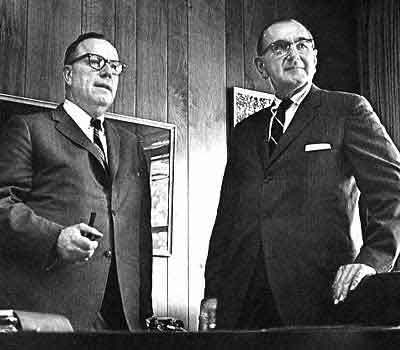 Willard, his father, and the Eisenhardts, Charles Jr., & Sr. bought the trademarks and assets of liquidated firm in 1942 and moved it to Blue Ash Rd. in Rossmoyne, Ohio, a Cincinnati suburb - renaming it after their two families: Hess & Eisenhardt. In addition to their Blue Ash Rd. plant, Hess & Eisenhardt used additional locations after the war, including one on Reading Road in Reading, Ohio. As Sayers & Scovill had numerous small plants scattered around Cincinnati before the war, it's only natural to assume that Hess & Eisenhardt inherited them. During the war Hess & Eisenhardt devoted it's plant to war work and won a number of contracts to build specialized trailers for the US Army. Most were built in small series and designed for specific war-time duties such as tank recovery and track-laying. With profits earned from their lucrative wartime contracts, Hess & Eisenhardt moved from Blue Ash to a brand-new factory in Rossmoyne, Ohio, another northeast Cincinnati suburb located a couple of miles away, in 1945. Due to shortages of materials and a pent-up demand for new vehicles it was a sellers market immediately following the war and Hess & Eisenhardt reserved most of their capacity to producing Sayers & Scovill professional cars. However a few 6-door airport limousines were produced, including one large order for twenty custom 1950 and 1951 Cadillac "harem cars". Built for King Ibn Saud of Saudi Arabia, they featured one-way glass that enabled the King's many wives to see out, but not be seen. The Secret Service became concerned about the safety of President Truman after a 1950 attack on Blair House where Truman was staying during a renovation of the White House, and approached General Motors about building a passenger vehicle that could withstand hand-weapon attacks. General Motors subsequently approached Hess & Eisenhardt, who undertook the highly specialized project. After looking at a number of armored vehicles, Hess & Eisenhardt determined a similar technique could be adapted for armoring automobiles. Thus began the company's long history of customizing armored cars for every president from Harry Truman through Lyndon Johnson. Four of the firms presidential limos are currently on display at the Henry Ford Museum in Greenfield Village in Detroit. In 1950, a Hess & Eisenhardt's competitor, the Henney Motor Company of Freeport, Illinois, was awarded a special contract to build a fleet of nine custom-built, long-wheelbase Lincoln Cosmopolitans for the Truman White House. One stipulation in the government's order was that the coaches must be armored by the industry leader, Hess & Eisenhardt. Armored limousines were subsequently built for many head's of state including Queen Elizabeth II, King Paul of Greece, and King Hussein of Jordan. J. Edgar Hoover and Mamie Eisenhower were other VIPs that rode in Hess & Eisenhardt-made coaches. Eisenhower's 1955 Cadillac limousine featured a retractable roof panel over rear passenger compartment and was built without a standard C-pillar using a Series 62 coupe rear window. (For younger readers, who may not know, Mamie was the wife of Dwight D. Eisenhower, our 34th President). Hess & Eisenhardt built a small number of Cadillac-chassised airport-style 12-passenger limousines for Colorado Spring's Broadmoor Hotel in 1955 and 1956. Built to replace a group of aging Cadillac Series 75 sightseeing coaches built in 1937 by A.J. Miller, the Hess & Eisenhardt Skyview limousines were built using a Cadillac Series 86 commercial chassis mated to a slightly altered Sayers & Scovill limousine-style hearse body. On some of the cars, four large smoked Plexiglas panels supported by a framework of exposed chrome-plated cross-members were inserted into the roofs for year-round sightseeing. The other Skyviews featured a roll-back canvas roof similar to the ones found in A.J. Miller's pre-war Broadmoor coaches. The Skyview's were built using a body-shell from a S&S Victoria funeral coach, but the Broadmoors's sloping C-pillars differed in one respect. Although set at an angle, they were perfectly straight and unique to the Skyview while the sloped C-pillars found on a Victoria funeral coach were noticeably curved. Skyviews shared the 3-piece rear windows found on most S&S professional cars (except for the high headroom ambulance and flower car) but the glass was fixed in place. The bottom half of the rear loading door opened into a small storage cavity behind the rear seat and the spare tire was stored in an under-floor compartment. All Skyviews were painted Mandan red with a beige side window surround. A feature unique to 1955 Broadmoors was their Eldorado-sourced rear wheel openings, which did not continue into the 1956 editions. Six were built and three are known to survive. Surprisingly when the Broadmoor Hotel replaced the aging 1955-56 SkyViews in 1959, Hess & Eisenhardt's arch-rival, Superior Coach was awarded the contract. Unlike the Skyview's which used extended wheelbase chassis, Hess & Eisenhardt's 1955-1956 View Master "woody" station wagons were built on a a standard 129" wheelbase Series 62 chassis with a Series 86 commercial cowl and floor pan. Most View Masters were built for 9 passengers, but a few dedicated 6-passenger cars were made, including the prototype. All the glass behind the B-pillars is unique to these cars except for the tailgates. 1955 models featured Chevy Nomad rear liftgate glass while 1956 model used standard Chevrolet-sourced 210 station wagon rear hatches. The first prototype View Master didn't include the DiNoc and fiberglass faux paneling found on the remaining vehicles and was painted Sea Island Green from head to toe. It was 1 of 12 built using 1955 Cadillac Series 62 chassis. Seven more Custom View Masters were built for the 1956 model year, making the grand total 19. Seven View Masters are known to survive and as most of them are currently owned by an Ohio collector, they're a common sight at regional Dayton and Cincinnati car shows. Joe Louis is one of the many celebrities known to have owned a Hess & Eisenhardt-built View Master. During the 1950s Hess & Eisenhardt was instrumental in the development of Cadillac's first electric sunroof, and also helped develop GM and Ford's first production padded vinyl roofs. First introduced on the Cadillac Seville, the first run of 50 or 100 such cars for both firms were done at the Hess & Eisenhardt plant. Late in the decade, Hess & Eisenhardt performed additional series-built conversions, but this time it was for the Ford Motor Company's luxury Lincoln Division. A total of 297 1959 and 1960 Lincoln Continental Mark IVs and Vs were converted at the Blue Ash Rd. plant. Built using a standard wheelbase 4-door sedan and available only in black, the cars featured an upgraded interior, a padded vinyl top with re-worked blind rear quarters and a custom-made rear windscreen. The Limousine version added a divider window and rear controls for the AM/FM radio and air conditioning. Two special-order Marks were built as well. The first, a 1959 Mark IV Landaulet, was built for Queen Elizabeth's 1959 tour of Canada. The second, a 1960 Mark V Town Car, was painted blue and featured the rear-seat radio and A/C controls from a limousine. Elvis Presley and Queen Juliana of the Netherlands are just two of the many celebrities known to have owned a Hess & Eisenhardt-built Mark IV/Mark V Lincoln. "I own one of two Hess & Eisenhardt Mark II convertibles made for Ford Marketing in the Chicago District. My car was made in December of 1955 while the Derham vehicle was introduced almost a year later. I have significant provenance. My car was awarded the "Willard Hess Award for Design Excellence" at the Ault Park Concours in the H & E hometown of Cincinnati. The award was handed to me by Mr. Hess' daughter. Many retired H & E employees admired their work." Hess & Eisenhardt built an armored Cadillac limousine in 1961 for Eqypt's president, General Abdul Nassar. Pictures also exist of a one-off 1961 Thunderbird in which Hess & Eisenhardt installed a flat, prescription-ground windshield for a Coca-Cola executive with a rare eye ailment that prevented him from looking through a curved-glass windscreen. Willard C. Hess told Bernie DeWinter in a 1977 interview that both he and the customer looked around for a long time in search of the car that would be the ideal candidate for such a rework, and when the new Thunderbirds came out in 1961, they both decided it was the car to use. He also said that the windshield only included a partial grind of the customer's eyeglasses prescription. Later in 1961 Hess & Eisenhardt had a hand in both designing and customizing JFK's massive Lincoln X-100 presidential limousine, which was built for the Secret Service by the Ford Motor Co and Hess & Eisenhardt. The legendary coach was built by cutting a standard convertible in half and stretching it by 33" between the front and rear axles. The unitized vehicle's rocker panels, cowl and cross-members were reinforced with 1/4" and 1/2" sheet steel and two new cross-members were added to make the vehicle as rigid as possible. Hess & Eisenhardt divided the passenger compartment in two with a disappearing glass divider behind the chauffeur's blue leather bench seat. A removable stainless-steel roll-bar was placed above the divider that allowed the president to steady himself if he wished to stand during a parade or public appearance. A pair of jump seats were installed in the rear compartment as was a hydraulic rear bench seat that could be raised by 10 1/2" allowing better visibility of the president, even while seated. A blue leather interior with matching Mouton carpeting and gold-embroidered lap robes incorporating the Presidential Seal were fitted as well. Retractable handles and steps were placed at strategic points around the vehicle and a number of removable tops and inserts were built so that the car could be used as a a totally closed car, a town car, a landaulet, or a convertible. Among the special tops were the famous three-piece "bubble top" Plexiglas roof, a seldom-seen 3-piece convertible top with an oval-shaped rear window and a two-piece Victoria-style hardtop that featured a brushed stainless steel panel over the driver's compartment. Hess told Bernie DeWinter that his friends at Ford and Fisher Body told him that there was no way he'd ever be able to afford to incorporate the stainless-steel panel, simply because of the outrageous cost of making the dies to form it. Hess' answer was to make the dies out of concrete! They only had to work one time, and they did; then they were reportedly left outside the back of the plant. Hess was justifiably proud of the finished product and commissioned a local jeweler to make a pair of nameplates for it that read: "Custom Built for the President of the United States by Hess & Eisenhardt Company, Rossmoyne, Cincinnati, Ohio." When he asked Lincoln executives if he could mount his nameplates on the car, they told him that he could mount them anywhere on the car except on the exterior. That frustrated him, until he got to looking and realized there was a better place for those plates. He mounted them on the rear door jambs just above the locks, so that whenever anyone got into the car, they'd see those fancy nameplates. He further stated that the executives at Lincoln had a fit when they heard what he did, and ordered him to remove them, but he reminded them of what they'd told him previously, so the plates supposedly were left in their original location. Hess was even called to Washington to consult with the Warren Commission on an investigation into the death. The X-100's original windscreen, cracked by a bullet from Oswald's rifle, sits on display in the American National archives to this day. Existing pictures show the limousine with its removable formal roof and molded glass ''bubble top", neither of which was used on the day of the assassination as Kennedy preferred an open-air car. The bubble top was sitting in Rossmoyne when he was assassinated. For years after, Hess speculated that if the president had been using the bubble top he might not have been killed. Right up until his death in 2000, Willard C. Hess was periodically interviewed by both journalists and conspiracy theorists about the X-100, and he was always happy to set aside time to talk about it, but there were a lot of details that he wouldn't reveal to anyone, even after all those years, for security reasons. Hess was also the guest speaker at the Professional Car Society's Awards Banquet in 1983, and the X-100 was a major topic of discussion. “It was probably the most fabulous automobile built in this decade,” Mr. Hess told the Cincinnati Rotary Club in 1964. George L. Strike - a Cincinnati millionaire and currently a co-owner of the Cincinnati Reds - bought Hess & Eisenhardt in 1974 from Willard C. Hess and Charles A. Eisenhardt. The two former owners remained for a while as part-time spokesmen. Armored limousine production continued through the 1970s with Canadian Prime Minister Pierre Trudeau and Nicaraguan president Anastasio Somoza, two notable customers. Hess & Eisenhardt built a series of Cadillac-based convertible starting in the late 1970s. The first, a DeVille called "Le Cabriolet" was first offered in 1978, the second, an Eldorado logically marketed as the "Eldorado", appeared in 1979. During 1981-82, Strike sold off two of the firm's three divisions a couple of years prior to purchasing an interest in the Cincinnati Reds baseball team. First to go was the Sayers & Scovill professional car division which was sold to Tom Earnhart, the former owner of Armbruster/Stageway in 1981. Earnhart had recently purchased Superior Coach from its parent company, Sheller-Globe, and transferred the S&S tooling and trademarks to the Superior plant in nearby Lima, Ohio. Next to go was the firm's prestigious, but much smaller, armored vehicle division, which was purchased by O'Gara Coachworks of Simi Valley, California in 1982. Tom O'Gara first learned the limousine trade while working at Moloney Coachbuilders during the early 1970s. He eventually moved to Simi Valley, California and started O'Gara Coachworks with his brother Ed in the second half of the decade. O'Gara moved the bulletproofing operation to nearby Fairfield, Ohio renaming it O'Gara, Hess & Eisenhardt. O'Gara, Hess & Eisenhardt has since worked on various Pentagon projects, including the up armored version of the HMMWV (Humvee) which is currently making headlines and was purchased in 2001 by Armor Holdings, Inc., one of the largest armoring firms in the world. The sole remaining division of Hess & Eisenhardt introduced a a new line of limousines in 1985. But they weren't going to be built in Rossmoyne. A new plant in Madison Heights, Michigan was outfitted to produce limousine versions of the downsized front-wheel-drive Cadillac C-body for sale through Cadillac dealers. Pre-1985 rear-wheel-drive Cadillac limousines were built by Fisher Body as complete cars (as opposed to modifications or stretches of an existing car) in the eight-passenger Fleetwood and seven-passenger Fleetwood formal (with glass divider) models. As Cadillac later built some of their new longer and restyled 1989 front-wheel-drive de Ville and Fleetwood models in the Hess & Eisenhardt Madison Heights plant, the ownership of the plant is a mystery. Eventually all DeVille assembly was transferred to Cadillac's modern Detroit-Hamtramck Assembly Plant, and the Madison Heights plant was closed.